Gmail, as one of the biggest Email client service, has a rather strong security protection system. However, for your security and privacy concerns, it’s recommended to often change the password of your Gmail account. 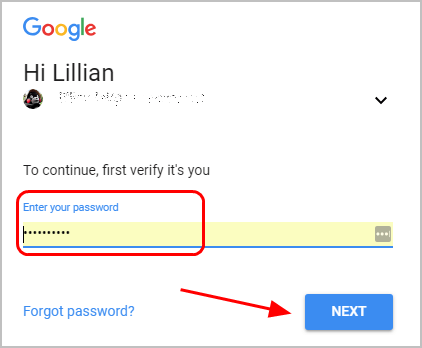 This article summarizes the easy ways to change your Gmail password. Check it out. 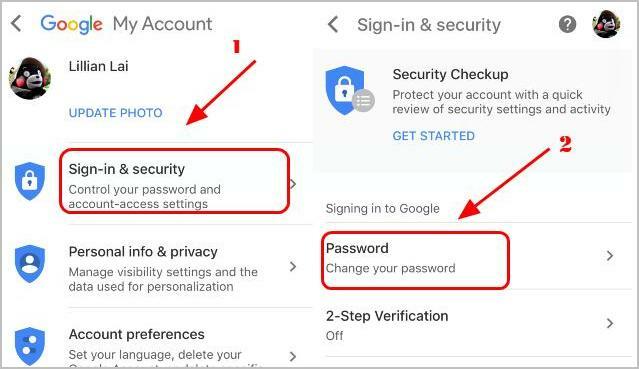 Changing your password for your Gmail account apply to all your Google services associated with the same Gmail account, so the password for those Google services, such as YouTube, Google+ changes at the same time. 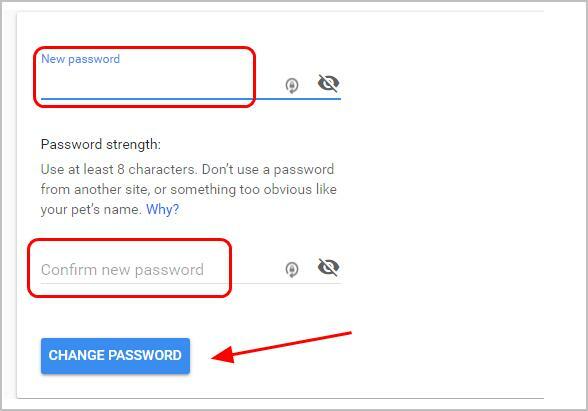 Here are the ways you can try to change the password for your Gmail account. You don’t need to try them all; just select the way you prefer and change the password in Gmail. 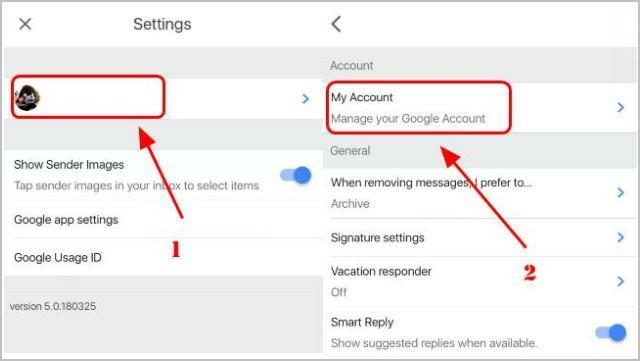 Note: If you’ve forgotten your Gmail password, you can check How to Recover a Forgotten Gmail Password Easily for easy tutorial to reset your Gmail password and recover your Gmail account. 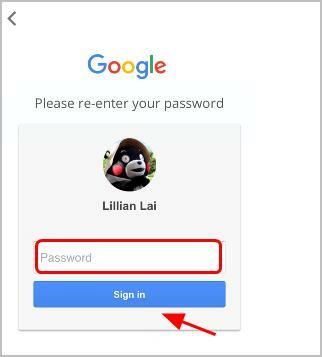 There’re two ways to manually change your password on Gmail, one is on the web browser, and the other is in the Gmail app. 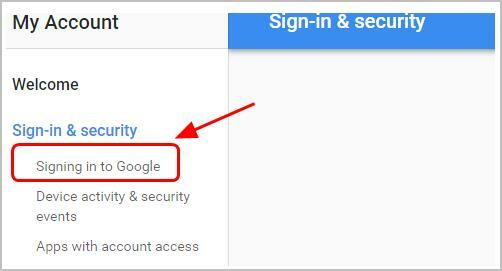 1) Sign into Google My Account page. You should be redirected to the My Account page if you’ve logged in your Gmail account. 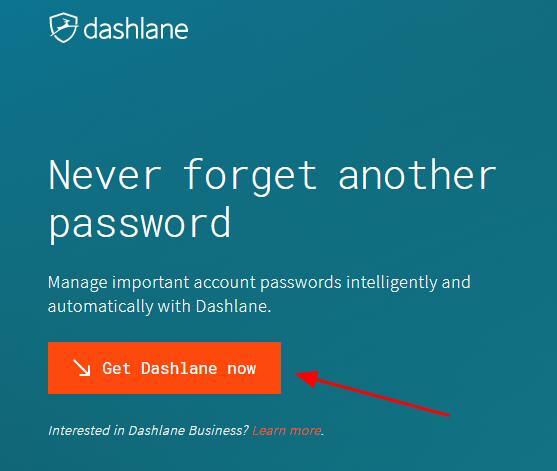 If not, you need to enter your Gmail address and password to sign in first. 2) Click the Sign-in & security section. 3) Click Signing in to Google. 4) Click Password in the Password & sign in method section. 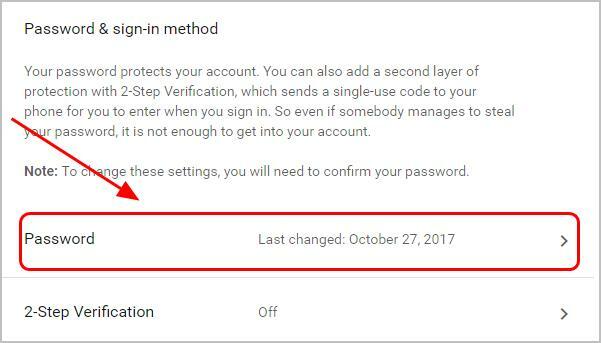 Note: It’s recommended to enable the 2-step verification to better protect your Gmail account from cyber hacks, or in case you lost your password. 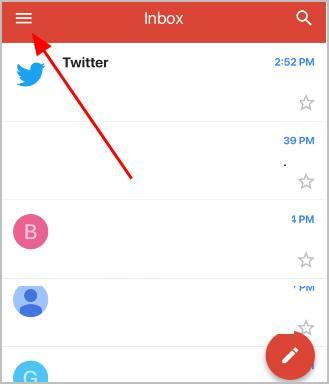 6) Enter your current password of your Gmail, and click Next. 7) Enter your new password, and repeat to confirm your new password. Then click CHANGE PASSWORD. You’ll be logged out after resetting your Gmail password. Log in again with your new Gmail password. Now you’ve changed your password successfully. 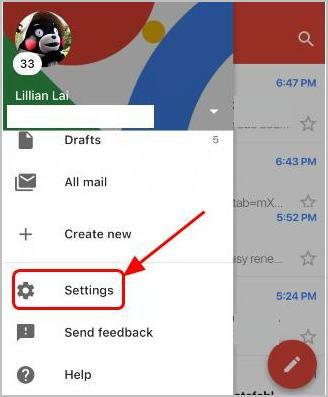 1) Open the Gmail application in your phone. If you haven’t signed in yet, sign into the Gmail account that you would like to change the password to. 2) Tap the menu icon on the upper left corner. 3) Scroll down the menu and tap Settings. 4) Tap your account profile, and go to My Account. 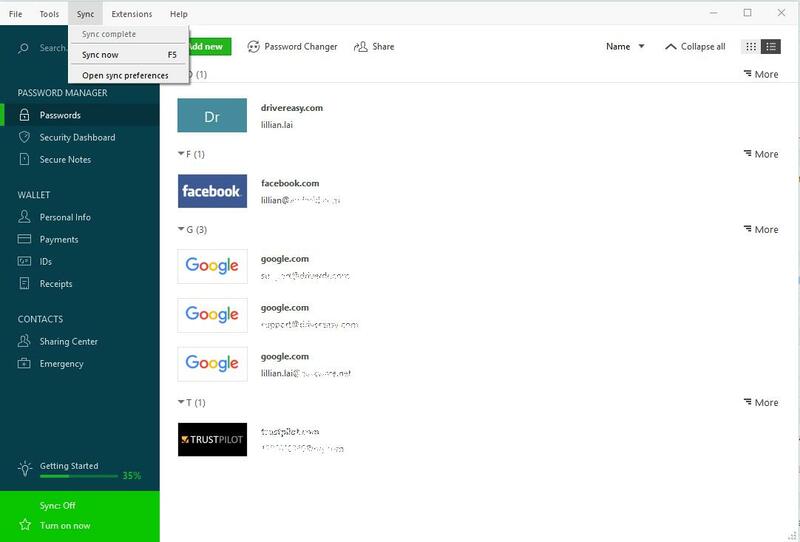 5) Go to Sign-in & security > Password > Change your password. 7) Re-enter your current password to proceed, and tap Sign in. 8) Enter your new password, and repeat it to confirm. Then tap CHANGE PASSWORD to finish. After resetting, you’ll be logged out your account. 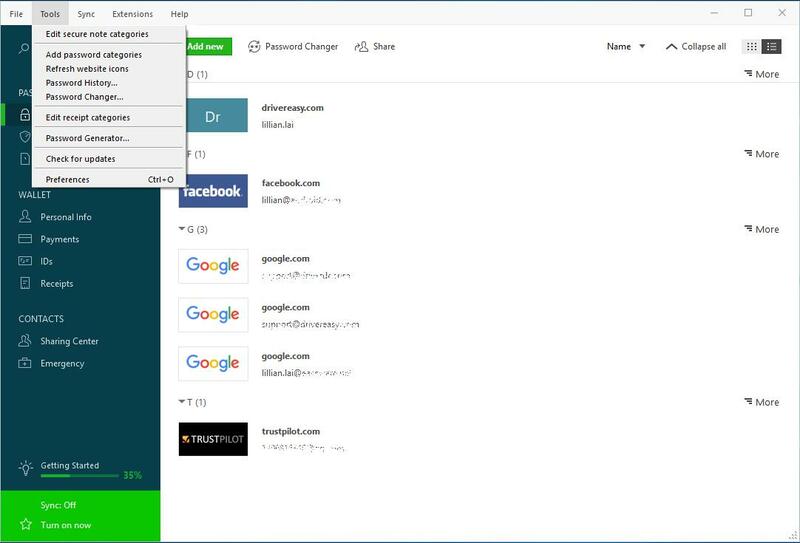 Enter the new password next time your log into your Gmail. Manually changing password requires time and patience. If you don’t have time or computer skills, you can try Method 2 to automatically do that. 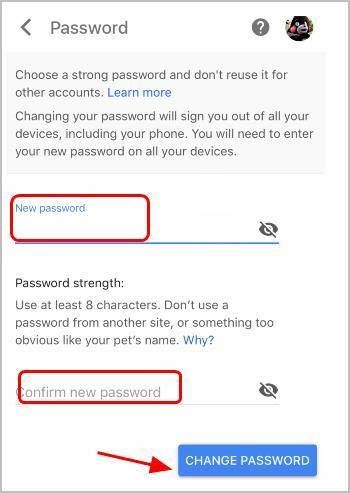 It not only requires time and patience to manually change your Gmail password, but is hard to remember the changing and complicated passwords as well. Now say goodbye to the long and tedious password changing process and keep your Gmail password safe and strong.